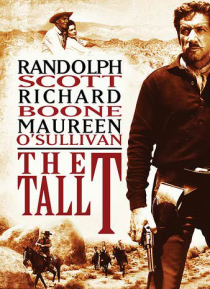 Filmed by legendary western director Budd Boetticher, THE TALL T is considered by many to be a classic of the western genre. Pat Brennan is a former ranch hand trying to make it on his own. After losing his horse in a bet, he finds himself on a stagecoach with Willard and Doretta Mims. When a pack of outlaws takes over the stagecoach and finds out that Doretta is the heir to a copper fortune, a ho… stage situation develops, and it's up to Brennan to save the day.